Objective To evaluate whether structural brain network metrics correlate better with clinical impairment and information processing speed in multiple sclerosis (MS) beyond atrophy measures and white matter lesions. Methods This cross-sectional study included 51 healthy controls and 122 patients comprising 58 relapsing–remitting, 28 primary progressive and 36 secondary progressive. Structural brain networks were reconstructed from diffusion-weighted MRIs and standard metrics reflecting network density, efficiency and clustering coefficient were derived and compared between subjects’ groups. Stepwise linear regression analyses were used to investigate the contribution of network measures that explain clinical disability (Expanded Disability Status Scale (EDSS)) and information processing speed (Symbol Digit Modalities Test (SDMT)) compared with conventional MRI metrics alone and to determine the best statistical model that explains better EDSS and SDMT. Results Compared with controls, network efficiency and clustering coefficient were reduced in MS while these measures were also reduced in secondary progressive relative to relapsing–remitting patients. Structural network metrics increase the variance explained by the statistical models for clinical and information processing dysfunction. The best model for EDSS showed that reduced network density and global efficiency and increased age were associated with increased clinical disability. The best model for SDMT showed that lower deep grey matter volume, reduced efficiency and male gender were associated with worse information processing speed. Conclusions Structural topological changes exist between subjects’ groups. Network density and global efficiency explained disability above non-network measures, highlighting that network metrics can provide clinically relevant information about MS pathology. Brain network analysis has been used to study topological alterations in pathology.7 For MS, diffusion-derived networks have shown reduced efficiency correlating with physical disability8 and network changes that suggest adaptations to preserve cognitive function.9 Whether network metrics explain disability beyond routine imaging metrics is unknown. Only one study addressed this but using only motor network efficiency.10 Additionally, network reconstruction techniques have not addressed tractogram biases.11 Recent technical work has improved the biological accuracy of streamline tractography,12–14 highlighting the necessity of state-of-the-art techniques in network studies. To our knowledge, these techniques have not yet been applied to MS. In this cross-sectional study, using advanced network reconstruction methods, we aimed (1) to compare structural networks between study subgroups, (2) to investigate whether network metrics explain EDSS and SDMT above conventional MRI metrics, and (3) to determine the best statistical model that explains better EDSS and SDMT. We recruited 122 patients with MS (58 RRMS, 28 PPMS and 36 SPMS) who had not experienced relapses within the preceding 4 weeks and classified as per Lublin and Reingold criteria.15 Fifty-one healthy controls (HC) were also examined. Participants underwent MRI and neurological assessment using EDSS.6 Verbal SDMT was performed in a subset of MS participants (n=60) (online supplementary etable 1) to screen for information processing speed. Fatigue (visual analogue scale), depression and anxiety (Hospital Anxiety and Depression Scale (HADS)) were also assessed in some patients (online supplementary etable 2). MRI data were acquired on a Philips Achieva 3T MR scanner (Philips Healthcare, Best, Netherlands) with a 32-channel head coil using (1) 3D sagittal T1-weighted scans with a fast-field echo scan, (2) whole brain High Angular Resolution Diffusion Imaging scan with echo planar imaging consisted of a cardiac-gated spin-echo sequence and (3) dual-echo proton density/T2-weighted axial oblique scans. All data were acquired with slices aligned with the anterior commisure - posterior commisure (AC-PC) line to minimise the effect of head positioning on data analysis. A non-rigid transformation was performed to register the subject’s non-filled T1-weighted bias-field corrected image to the corresponding diffusion-weighted image (DWI) using BrainSuite V.15b16 resulting in a structural image of resolution 2×2×2 mm3. The lesion-filled T1-weighted images17 were then segmented into different tissue types and parcellated according to Desikan-Killiany-Tourville atlas protocol using GIF.18 The volumes of the various tissue types were estimated (normal-appearing brain volume (NABV), GM, cortical GM (CGM), deep GM (DGM)). Reduction of these volumes reflects atrophy. Lesion load (LL) was also computed as a measure of WM damage. The mean b0 image was rigid registered to the first b0 image. Then, the same rigid transformation was applied to the 61 DWI volumes. FSL V.5.0.9 was used on the DWI data to correct for eddy currents and head motion19 and BrainSuite V.15b to correct for Echo-planar imaging (EPI) distortions using the T1-weighted image as the registration template for the diffusion data.16 For probabilistic tractography, we used second-order integration over fibre orientation distributions (iFOD2) estimated with constrained spherical deconvolution (CSD).20 A total of 107 streamlines were generated implementing the anatomically constrained tractography (ACT) algorithm12 followed by spherical-deconvolution informed filtering of tractograms (SIFT2)13 (MRtrix3 V.0.3.14 package). We constructed a symmetric matrix consisting of 120 nodes. Each network edge was defined as the sum of weights of streamlines connecting a pair of nodes.13 Figure 1 summarises the pipeline. We extracted a range of standard network measures using TractoR21: Edge density, also known as connectivity, is the ratio of the connections exist relative to the number of potential connections. Global efficiency is a network integration metric that describes the information flow over the entire network while local efficiency is considered a local homolog quantifying information transfer within local networks. Finally, clustering coefficient reflects the number of connections between neighbouring nodes and is related to network segregation 22 (for further details on MRI parameters and analysis see online supplementary methods). Flowchart of brain network reconstruction. For each subject, (A) T1-weighted image is segmented into grey matter (B) and white matter (C). The grey matter segmentation is parcellated into cortical and deep grey matter regions (B), which serve as network nodes (D) in the subsequent network-based analysis. From a diffusion-weighted image (DWI) (E), voxel-wise fibre orientation distribution (FOD) (F) is estimated and whole-brain tractography undertaken (G), with the white matter segmentation (C) used to prevent this from spilling into grey matter (see main text for details). Finally, nodes and tractogram are modelled into a network (H). Connections are weighted by the sum of the pairwise streamline weights. Statistical analysis was performed using R software (https://www.r-project.org/ V.3.3.0). For all the models, we explored whether there was a violation of normality assumption of the residuals. Data are reported as mean±SD, unless otherwise stated. P values <0.05 were considered statistically significant. To assess network differences between subjects’ groups, ANOVA analysis was used, adjusting for age, gender, LL and total intracranial volume (TIV) to correct for head size. To explore possible associations of all the variables in patients, we used bivariate Pearson’s correlations. The variables include network metrics (edge density, global efficiency, mean local efficiency and mean clustering coefficient), atrophy measures (NABV, GM, CGM, DGM), WM damage metrics (LL), clinical scores (EDSS and SDMT) and patient age and gender (figure 2). In this study, atrophy measures and WM lesions are also referred to as MRI metrics. Volumetric differences between HC and patients with MS were also assessed (online supplementary etable 3). Descriptive pairwise univariable associations in patients. The reported value in each entry of the matrix corresponds to the pairwise Pearson correlation coefficient (r). Gender is a binary variable in which 0 is male and 1 female. CGM, cortical grey matter; DGM, deep grey matter; ED, Edge density; EDSS, Expanded Disability Status Scale; GE, global efficiency; GM, grey matter; LL, lesion load; mCC, mean clustering coefficient; mLE, mean local efficiency; MRI, magnetic resonance imaging; NABV, normal appearing brain volume; NAWM, normal appearing white matter; SDMT, Symbol Digit Modalities Test. We performed stepwise linear regression analyses using each of the volume metrics (in turn) as independent variables and age, gender and LL as covariates to explain clinical scores (dependent variable). We also controlled for the presence of disease-modifying treatments (DMTs). We selected the best model as assessed with the adjusted R2 (Adj.R2) and then added each network metric, in turn, as an independent variable. For SDMT, we performed a post hoc analysis controlling for education level as a categorical and afterwards as a continuous variable to investigate a possible linear relationship between education level and SDMT. To assess whether the effect for each network metric in explaining disability is group dependent, we stratified the MS population based on their clinical profile by creating an interaction term, for example the product between the network metric and a categorical variable for MS subgroup (RRMS, PPMS, SPMS), ‘network metrics×MS subgroup’, that was then included in the model as an explanatory variable. For SDMT, we explored possible associations between network metrics and MRI variables in HC. To find the best model that explains disability, a stepwise forward selection linear regression strategy was employed. All variables of interest were sequentially added to the model and kept only if significant, culminating in two final models, one per each clinical score. Demographic, clinical, MRI and network data from patients with MS and HC are summarised in table 1. There was a significant decrease in global efficiency (regression coefficient (RC)=−71.23, p=0.016), mean local efficiency (RC=−72.53, p=0.031) and mean clustering coefficient (RC=−14.84, p<0.0001) in the whole MS group when compared with HC. For the subtypes, there was reduced global efficiency in PPMS (RC=−85.82, p=0.027) and in SPMS (RC=−145.34, p=0.0002) relative to HC and also decrease in this metric in SPMS relative to RRMS (RC=−111.90, p=0.0008). Mean local efficiency was reduced in SPMS compared with HC (RC=−158.42, p=0.0002) and to RRMS (RC=−128.21, p=0.0007). Relative to HC, mean clustering coefficient was reduced in RRMS (RC=−14.84, p<0.0001), PPMS (RC=−13.42, p<0.0001) and SPMS (RC=−20.30, p<0.0001) while relative to RRMS it was reduced in SPMS (RC=−8.30, p=0.0033). There was also a significant decrease in SPMS compared with PPMS (RC=−6.88, p=0.037). All models were adjusted for age, gender, LL and TIV (table 2). 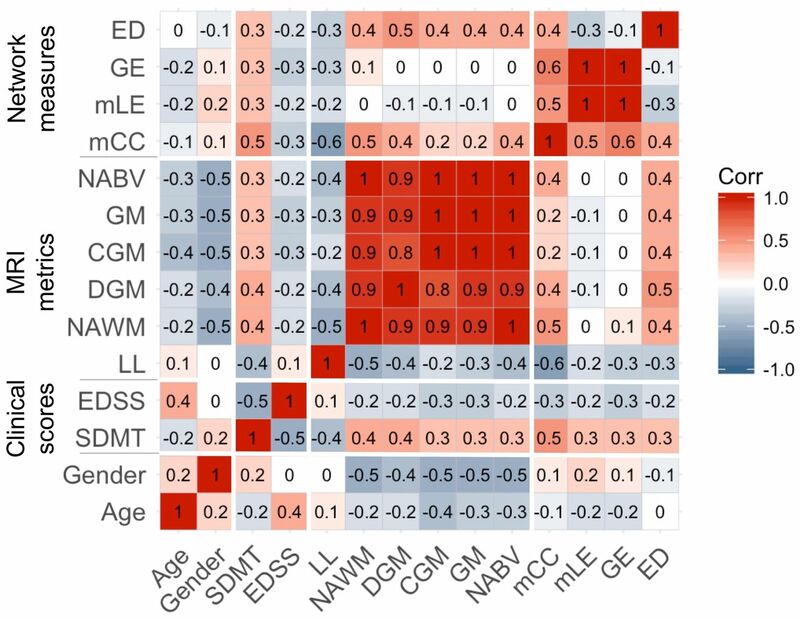 Pairwise associations among clinical, volume and network metrics, LL age and gender study variables are shown in figure 2. Higher LL was associated with lower connectivity (r=−0.3), lower values of global (r=−0.3) or local (r=−0.2) efficiency and reduced clustering (r=−0.6). Also, lower connectivity and lower clustering coefficient were associated with reduced volumes of NABV, GM, CGM, DGM and normal-appearing WM (NAWM) (r=between 0.2 and 0.5). Moreover, we found associations between clinical scores and network measures; for example, higher EDSS and lower SDMT scores were associated with lower connectivity values, global and local efficiency and clustering coefficient (r=between 0.2 and 05). Additionally, correlation analyses between clinical scores and volume metrics demonstrated that higher EDSS scores and lower SDMT were associated with reduced volumes of NABV, GM, CGM, DGM and NAWM (r=between 0.2 and 0.5). Higher LL was also associated with decreased SDMT (r=−0.4) but showed very little correlation with EDSS score (r=0.1). We also found that higher EDSS score is associated with lower SDMT score (r=-0.5). Gender showed weak associations with network metrics (r=between −0.1 and 0.2). For age, we found that older participants show lower values of network metrics (r=−0.1 and 0.2) except edge density that shows weak linear relationship (r<0.05). We found that NABV was the only significant independent variable of EDSS after adjusting for age, gender and LL. For each millilitre decrease in NABV, there was an increase in the EDSS score of 4.06×10–3 (95% CI −7.68×10–3 to −4.3×10–3, p=0.029, Adj.R2=0.185; table 3). We did not find any significant adjusted associations between the other volume metrics and EDSS. When network metrics were added to the model reported above as independent variable, in turn, we found that they were each associated with EDSS independently of NABV. Specifically, for each percentage point decrease in edge density, there was an increase in the EDSS score of 0.13 (95% CI −0.27 to −1.49×10–3, p=0.047, Adj.R2=0.205), and for each unit decrease in global efficiency, there was an increase in EDSS of 2.67×10–3 (95% CI −4.75×10–3 to −5.81×10–4, p=0.013, Adj.R2=0.221). For each unit decrease in mean local efficiency, there was an increase in EDSS of 1.90×10–3 (95% CI −3.76×10–3 to −4.40×10–5, p=0.045, Adj.R2=0.206), and for each unit decrease in mean clustering coefficient, there was an increase in EDSS of 3.98×10–2 (95% CI −6.34×10–2 to −1.61×10–2, p=0.011, Adj.R2=0.235) (table 3). We did not find any significant difference in the effect of any of the network measures in any of the MS subgroups examined. All the above models were adjusted for age, gender, LL and DMTs. The best model to explain EDSS using the stepwise forward selection linear regression analysis showed that lower edge density, lower global efficiency and increased participants’ age explained 26% of the variance in EDSS (table 3). The explained variance is higher compared with 18.5% for NABV alone or with 20% for global efficiency (−0.02, 95% CI −0.0049 to −0.00063, p=0.012) or with 20% for edge density (−0.16, 95% CI −0.28 to −0.035, p=0.012). We repeated the multiple linear regression analyses to explain SDMT. When only volume metrics were included, the best model fit was achieved by DGM as independent variable, showing that for each 1 cm3 decrease in the volume of DGM, there was a decrease in the SDMT of 1.61 (95% CI 0.79 to 2.43, p<0.001, Adj.R2=0.361; table 4), that is, smaller DGM volumes were associated with worse information processing speed in the whole MS group. When we added network metrics, in turn, in our multiple regression analysis that included DGM, we found that global efficiency, mean local efficiency and mean clustering coefficient were able to significantly explain additional variance in SDMT. For each unit increase in global efficiency, there was an increase in the SDMT of 0.02 (95% CI 0.01 to 0.04, p=0.008, Adj.R2=0.396). For each unit increase in mean local efficiency, there was an increase in the SDMT of 0.02 (95% CI 0.002 to 0.03, p=0.018, Adj.R2=0.380), and finally for each unit increase in mean clustering coefficient, there was an increase in the SDMT of 0.21 (95% CI 0.05 to 0.38, p=0.013, Adj.R2=0.387). There was no evidence of change of SDMT per percentage increase in edge density (0.44, 95% CI −0.56 to 1.44, p=0.38, Adj.R2=0.374; table 1). Additionally, there was no significant difference in the effect of any of the network metrics in any of the subgroups examined while the statistical models do not explain SDMT in HC. All the above models were adjusted for age, gender, LL and DMTs. The best model to explain SDMT using the stepwise forward selection linear regression analysis showed that greater DGM volume, greater global efficiency and female gender were all associated with better information processing speed (table 1). This model explained 39.6% of the variance in SDMT scores compared with 36% for the DGM alone (1.61, 95% CI 0.79 to 2.43, p<0.001). This study showed structural network topological changes within the various MS groups. We also demonstrated that markers of structural network disruption explain EDSS and SDMT scores above metrics of tissue atrophy and WM lesions. We detected network topological changes in MS. Relative to HC, SPMS had reduced global and local efficiency, PPMS reduced global efficiency while there was no efficiency change in RRMS. These changes reflect network alterations due to diffuse WM pathology including impaired long-distance and short-distance connections, characteristics that are more prominent in the progressive types. Previous studies focused mainly on RRMS reporting decreases in this metric in structural8 21 22 and functional22–24 networks while others, in accordance with this work, found no differences.25 Intriguingly, increased efficiency in RRMS in the first year from onset in the absence of clinical impairment is suggestive of structural adaptations to maintain normal function.9 Our RRMS cohort has a relatively long disease duration with high EDSS due to accrual of baseline disability as a result of incomplete recovery from relapses explaining partly the absence of this effect. Yet, only one study considered SPMS and PPMS group reporting reduced global efficiency, in accordance with our findings.21 Moreover, we demonstrate reduced global and local efficiency in SPMS relative to RRMS, a result likely to reflect the neurodegenerative component in this progressive subtype. Clustering coefficient is a ‘small-world’ metric and reduction suggests a more random architecture26 related to increased disability as shown in our study and elsewhere.27 Previous structural studies reported increased clustering coefficient in RRMS compared with HC9 28 29 and is thought to reflect transient compensatory changes. No change was reported in functional networks.23 30 Here, we report a decrease in clustering coefficient in RRMS compared with HC, in agreement with a study that investigated both structural and functional networks.22 We also extend these findings demonstrating reduction of this metric in the progressive phases. Clustering coefficient was further reduced in SPMS relative to RRMS and PPMS indicating that impaired local information flow is linked to the disease severity. Nonetheless, further investigations with bigger sample sizes and longitudinal study design should confirm the study findings. Whole brain atrophy is a relatively strong predictor of EDSS. Our study shows that the addition of network metrics into the model, singly and together, explains more EDSS variance, leading to our final model (table 3), according to which edge density and global efficiency explain 26% of the variance, that is 7% more compared with NABV alone (19%). Loss of connectivity could reflect neurodegeneration due to continuous inflammation31 while reduced global efficiency could indicate impaired structural long-range connections probably due to inflammatory activity and neuroaxonal loss.32 The fact that these measures integrate information beyond local tissue damage and atrophy measures may account for the increased explained variance. SDMT was most strongly associated with DGM atrophy and WM damage.33 Previous structural and functional studies demonstrated the relationship between network disruption and cognitive impairment.4 33 34 Our study findings showed that global efficiency is associated with SDMT as previously shown and it also explained additional variance (table 1) highlighting that intact network integration is important for efficient information processing beyond participant’s education level and treatment. These findings are also consistent across WM diseases35 signifying the relevance of network efficiency as potential marker of cognitive disability. MS is a heterogeneous disease. This study included patients with MS with the main disease phenotypes in order to provide a representative snapshot of structural networks throughout the entire disease course. Our regression analyses show that the behaviour of the network metrics was similar in all MS subtypes suggesting that these measures could be useful across the whole MS disease spectrum. The same statistical models did not explain SDMT in HC. This negative result is not surprising given the narrow distribution of the SDMT variable in HC compared with patients (see table 2 for mean and SD). Furthermore, due the small number of HC for which we have SDMT (n=12), these results should be interpreted with caution. Future studies could assess whether the findings presented here are replicated in other cohorts. Our univariate associations in patients revealed some interesting patterns. Low values of network metrics were associated with clinical impairment and worse information processing speed in accordance with previous studies.8 22 25 Interestingly, reduced clustering showed the strongest association out of network metrics with worse SDMT indicating that network randomisation impairs information processing speed as shown previously.27 Our multivariate analysis though demonstrated that reduced network integration and tissue atrophy can more strongly affect SDMT performance. In line with previous work,8 WM lesions impair the communication between brain regions at the global and local level as demonstrated by the reduced network efficiencies. As shown in the exact same cohort, we did not find any association between WM lesions and EDSS10 and only weak association between WM lesions and SDMT, and this highlights the need to explore non-conventional MRI metrics to explain disability. Also, there was no association between edge density and any of the network efficiencies. Although this could be the result of wiring cost and efficiency,26 we argue that direct comparison between binary and weighted network is not valid. In our approach, we used CSD to model intravoxel crossing fibres,20 and ACT and SIFT2 to improve connection and streamline density,12 13 respectively, with the assumption that the FOD amplitude corresponds to the underlying fibre density.36 These advanced methods improve tractogram reconstruction without the need of various scaling techniques.14 We also provided anatomical prior of the WM ensuring that no streamlines are incorrectly terminated in the WM due to lesions (online supplementary efigure 1). In fact, we identified an association between LL and connectivity, but this correlation is not that high (r=−0.3), which highlights that our current approach is not overly influenced by lesions. This study has several limitations. In our approach, we applied techniques to address some of the reconstruction biases and to ensure that no streamlines were abnormally terminated in WM.12–14 However, histological validation studies are required to make direct links between imaging measures and underlying pathology. Additionally, the cross-sectional design of the study does not allow to determine the clinical relevance of network measures over time. Moreover, we used SDMT scores for approximately half of MS cohort (n=60 vs n=122), but this subcohort had similar proportions of MS subgroups to the whole cohort (online supplementary etable 1). Also, the effects of fatigue, depression and anxiety can be investigated in future studies with larger cohorts. A post hoc analysis revealed depression and anxiety scores showed mild correlations with SDMT whereas fatigue did not. It is difficult to investigate their influences in our cohort as the HADS and fatigue scores were not collected in all subjects with SDMT. Finally, although the effect of cortical lesions in clinical scores is limited,37 it is possible that they may influence our study outcomes. The study findings could provide the basis for future work. 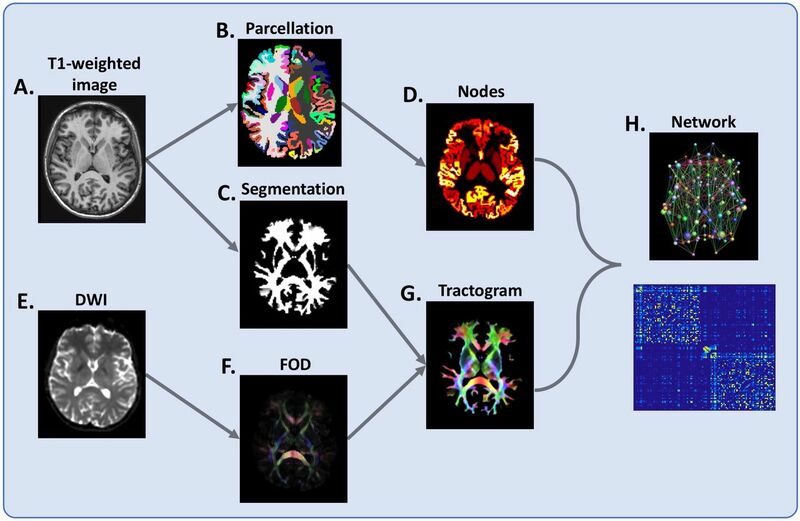 There are different scales that we could study MS from, including micro, meso and macro scales.38 Network analysis offers a framework at the macroscale to study whole brain connectivity patterns beyond focal pathology while TBSS, for example, is currently considered a leading technique for the voxel-wise DTI analysis.4 Future investigations could focus in the comparison between scales and their link with clinical outcome. Additionally, further studies could follow a subnetwork or nodal rather than global network analysis and perhaps derive integrative measures of structural and functional networks and investigate if these parameters explain additional variance. In conclusion, we found distinct network organisation in the various groups. Also, network metrics and in particular global efficiency explains disability over and above non-network metrics supporting the relevance of intact long-distance connexions mainly, to maintain normal function. These results highlight the potential of network parameters as biomarkers for disease diagnosis, prognosis and in clinical trials. The authors would like to thank all the patients in this study and Professor David Miller and Dr Nils Muhlert for the recruitment of the participants.
. Correcting susceptibility-induced distortion in diffusion-weighted MRI using constrained nonrigid registration. Signal Inf Process Assoc Annu Summit Conf APSIPA Asia Pac, 2012.
. Functional brain network alterations in clinically isolated syndrome and multiple sclerosis: a graph-based connectome study. Radiology 2017;282:534–41.
. TractoR: magnetic resonance imaging and tractography with R. JSS, 2011. Contributors TC: original design, data analysis, drafting of the manuscript. CT: data analysis, drafting of the manuscript, critical revision. FP: data analysis, critical revision. BK: data analysis, critical revision. DTC: study conception, data acquisition, critical revision. SO: data analysis, critical revision. JDC: original design, data analysis, critical revision. CAMGW-K: original design, data analysis, critical revision. AJT: original design, data analysis, critical revision. ATT: original design, data analysis, critical revision. Funding The NMR unit where this work was performed is supported by grants from the Multiple Sclerosis Society of Great Britain and Northern Ireland, Philips Healthcare, and supported by the UCL/UCLH NIHR (National Institute for Health Research) BRC (Biomedical Research Centre). TC is supported by grant from the Leonard Wolfson Foundation. CT has received a post-doctoral research ECTRIMS fellowship (2015). FP is supported by a Guarantors of Brain non-clinical postdoctoral fellowship. SO is funded by the National Institute for Health Research University College London Hospitals Biomedical Research Centre (NIHR BRC UCLH/UCL High Impact Initiative BW.mn.BRC10269). SO also receives funding from the EPSRC (EP/H046410/1, EP/J020990/1, EP/K005278), the MRC (MR/J01107X/1) and the NIHR Biomedical Research Unit (Dementia) at UCL. CAMGW-K has received research grants (PI and co-applicant) from Spinal Research, Craig H. Neilsen Foundation, EPSRC, Wings for Life, UK MS Society, Horizon2020, NIHR/MRC. Competing interests AJT has received honoraria/support for travel for consultancy from Eisai, Biogen (Optum Insight), Hoffman La Roche, MedDay, TEVA, Almirall, and Excemed. He received support for travel for consultancy as chair of the International Progressive MS Alliance Scientific Steering Committee, and member of the National MS Society (USA) Research Programs Advisory Committee. He receives an honorarium from SAGE Publishers as Editor-in-Chief of Multiple Sclerosis Journal and a free subscription from Elsevier as a board member for the Lancet Neurology. Support from the NIHR UCLH Biomedical Research Centre is acknowledged. CT has received an ECTRIMS post-doctoral research fellowship in 2015. She has also received honoraria and support for travelling from Bayer-Schering, Teva, Merck-Serono and Serono Foundation, Biogen, Sanofi-Aventis, Novartis, and Ismar Healthcare. FP is non-clinical Guarantors of the Brain fellow. He has also received honoraria from Bioclinica Inc. DC has received honoraria (paid to his employer) from Ismar Healthcare NV, Swiss MS Society, Excemed (previously Serono Symposia International Foundation), Merck, Bayer and Teva for faculty-led education work; Teva for advisory board work; meeting expenses from Merck, MS Trust, National MS Society, Novartis, Société des Neurosciences and Teva; and has previously held stock in GlaxoSmithKline. ATT has received speaker honoraria from Biomedia, Sereno Symposia International Foundation, Bayer and meeting expenses from Biogen Idec and is the UK PI for two clinical trials sponsored by MEDDAY pharmaceutical company (MD1003 in optic neuropathy [MS-ON] and progressive MS [MS-SPI2]). Ethics approval This study was approved by the local UCL Research Ethics Committee.